One thing I get frustrated with when it comes to books that cover the financial crisis is that they start in 2001, or at earliest from the early 1990s with the creation of the credit default swap. I think that there is a bigger story, both of deregulation and the change of the financial sector since the 1980s, as well as a political economy story, with the growing overlap between the financial and the elite classes, and in general those stories get lost in the desire to watch the implosion of late 2008 run in slow motion. But I’ve just read two books that each add a new layer to the story of the financial crisis we find ourselves in, and I’d like to talk about them quickly. I’m terrible at reviewing books, but I do want to talk about what each of these books add to the conversation. If you read this blog, chances are you read Baseline Scenario where Johnson and Kwak blog. So let’s get the obvious question out of the way: “If I read Baseline, should I read the book?” Yes. It’s a weird new media question to ask, like a “if I’ve seen the movie should I read the book?” kind of thing. But there is a bunch of new material, and the book approaches the issue of the political economy of the financial sector, the bailout, the events that lead us here and the proposals to lead us out from a few steps back which allows the reader to see it fresh. The book walks us backwards through time for a history of the United States’ relationship with banking, up and to the “rip the face off the customer” era of financial markets in which we find ourselves. It also gives a cross-section of the numerous financial crisis that have occurred across the world, using Korea and Russia as particularly interesting case studies. It also brings us through 2009 which I think is the most fascinating part of the story, and gives some coverage on how the current reform efforts look. I think it is one of the few (only?) books that brings up campaign contributions from the financial sector, which should tell you plenty enough about how lacking many of the other financial narratives are when it comes to the political realm. Again, it is very likely you read Naked Capitalism, and again you should read this book. If 13 Bankers gets deep into the political economy, Econned gets deep into the plumbing of the financial sector in a way no other book has. It isn’t for novice readers, but it is perfect for those who know finance from the blogs or news coverage and want to go deeper into the specifics. It is worthwhile if only for the chapters that are about the deregulation of the financial markets. Rather than something that happened at some point in the 1990s, Yves works the history back to the 1960s and 1970s and shows how a new type of financial market started to show up. The first half of the book is a history of economic thought. It weaves the new Chicago economic thinking and the new financial thinking together in a way reminiscent of Perry Mehrling’s work on Fischer Black and the history of finance and macroeconomics. And the chapter on the shadow banking market is a great exploration, in particular how it shows the nuts and bolts of how the shadow banking sector was created. I think these two books will mark a pivot of the narratives of the crash to a more sophisticated understanding of where we have come from and the real issues of how we govern ourselves and what kind of economy do we want to build. Both are highly recommended. Forgive me if you’ve already talked about this book as I am an infrequent visitor. However, I do highly recommend reading ‘Web of Debt’ by Ellen Hodgson Brown. It exposes the true nature of the US money supply and goes back to the founding of the country to reveal how it has not always been this way. 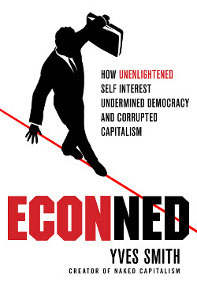 I finished reading ‘ECONned’ and together with ‘Web of Debt’ it has shown me that there is hope for a way out of this mess. So instead of using the arbitrary date of “early 1990’s” or “when CDS'” were invented, we should use “1980’s” instead? Why not start in 1938? Or 1492? As an aside, I think they should have used MY book covers. Thanks, WordPress, for linking one of them here :P.